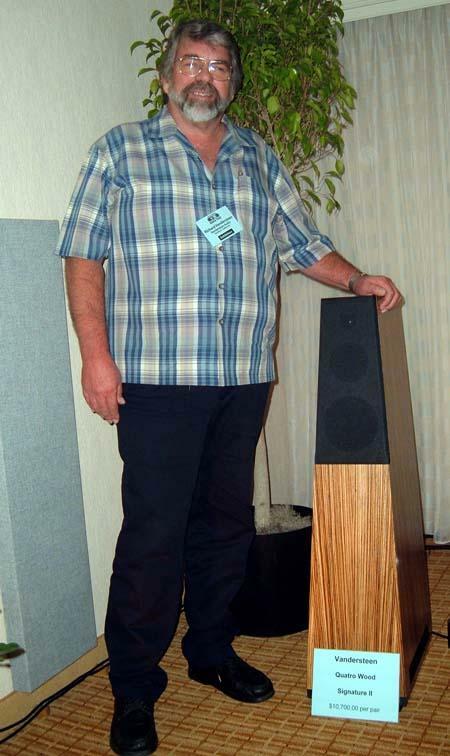 Southern California's Brooks Berdan, Ltd. continued to affirm the store’s reputation for high-quality sound in its Ayre/Vandersteen room, which had also impressed Wes Phillips in an earlier blog entry. Listening to the Ayre MXR 300W monoblocks ($16,500/pair), K-1x preamp ($7000), C-X5e universal player ($5950), and about-to-be-released power conditioner, connected to each other and the wood-finish Vandersteen Quatro speakers ($10,700/pair) by Ayre's own cabling, I encountered a soundstage whose height and depth had no right to exist in such a small space. But beyond issues of size and depth, listening to a Channel Classics SACD of the Ebony Band Amsterdam performing the music of Silvestre Revueltas enabled me to enter that composer's phantasmagoric universe in a deeper, more all-consuming way that I had ever before experienced. It was as if I was inside Revueltas' head, haunted by the very demons that drove him to write his extraordinary music. To discover myself so immersed in music in the middle of a bustling show was a rare gift. The Immedia room proved an isle of sanity amidst the clamor. As I entered, the folks were playing Analogue Productions’ HQ-180 pressing of Chet. 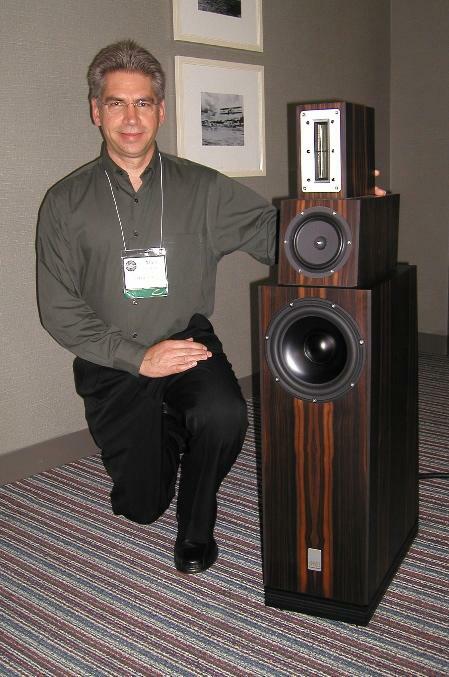 Heard through Joachim Gerhard’s somewhat diminutive, 90 lb Sonics Allegria speakers ($15,000/pair, shown above with Immedia’s Allen Perkins), the trumpet sounded far bigger and lifelike than speakers this size “should” make it sound. Equally impressive were the amazing depth, height, and width of the soundstage. 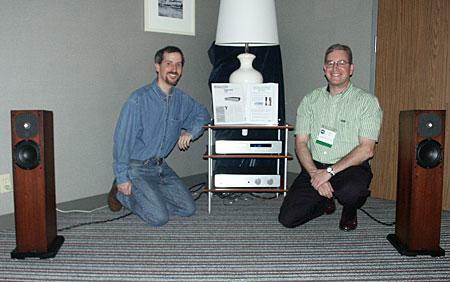 No small part of the credit is due Perkins’ Spiral Groove SGI turntable ($20,000), Immedia RPM tonearm ($2995), Lyra Skala cartridge ($2500, a replacement for Lyra’s Helicon), the Lyra Connoisseur 4-2LSE preamp ($25,000), and Ayre V5XE 150 Wpc amp ($4500). 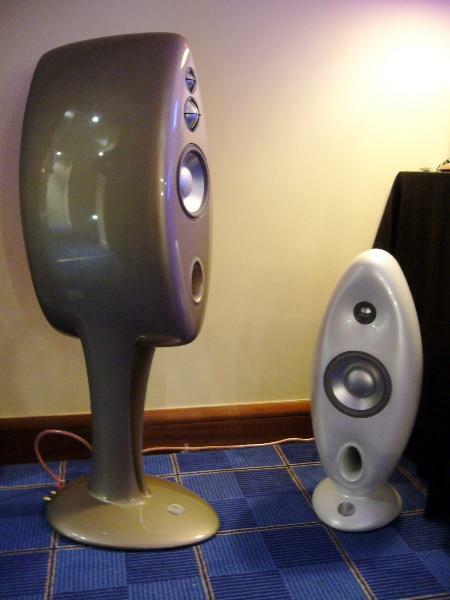 In the Simaudio/Dynaudio room, the sheer size and weight of the bass commanded equal respect. This was some of the finest low bass extension I have so far encountered at the show. (The bass impact of the new Wilson Watt/Puppy8s also deserves mention). Imagine my surprise when, after my audition, Simaudio’s Costa Kouliisakis told me that he had not yet succeeded in getting the room to deliver all of the deep bass extension the equipment was capable of producing. Saturday’s first taste of the real thing for this writer came in the form of midrange truth. The location was the third floor Santa Cruz room put together by Optimal Enchantment, a Santa Monica-based high-end retailer whose 25 plus-year history in the business perhaps grants it the right to so audacious a name. The amps were Audio Research REF 610 monoblocks, each of whose twenty glowing 6550 output tubes help account for their 600W output and $40,000/pair price tag. 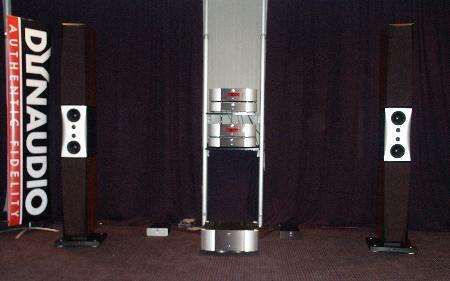 Speakers were an industry given, the Vandersteen 5As, the cable Audioquest, and the turntable a Basis Debut Signature ($10,900) outfitted with a Transfiguration Orpheus cartridge ($5,000) and Basis Vector Model 3 tonearm ($3750). After lunch, I wandered into the Joseph Audio room. I had initially encountered Jeff Joseph on Wednesday afternoon as he was attempting to cart four huge boxes of equipment into the hotel by stacking them one atop the other on a flimsy two-wheel luggage cart. Needless to say, upon encountering a small hump at the hotel threshold, the poor thing began to bend under the weight, unceremoniously depositing Jeff's boxes on the floor. Like someone kicking a mule whose hind legs have collapsed under it, Jeff attempted to wrestle with the beast, trying to convince it to perform its intended duty. The man may have the wherewithal to produce uncommon speakers that have received three "Best Sound at the Show" honors, but he seems to share a common human failing with yours truly—an occasional refusal to acknowledge the obvious. Unexpected amusement greeted me in the small Covenant Audio & Aaudio Imports room. As soon as I entered, an overgrown post-adolescent seated himself in the sweet spot, took one look at the visually stunning Wavac HE-833v1.3 tube monoblocks ($69,000/pair), Wavac PR-T1 tube preamp (a mere $30K), Acapella High Violin MK 888 horn speakers ($48,000/pair—where do they get these names? ), and Accustic Arts Drive and DAC ($12,800 together), all held together and powered by assorted cables and power products from PranaWire, Stealth and Isoclean, and blurted out, "This looks like super-high end." My final visit of the Show's first public day was to Jay Rein's Bluebird Music, Ltd. room. Tucked into a small niche in a space otherwise dominated by Chord electronics and Neat loudspeakers (which Jay considers an ideal match for Chord) sat an unobtrusive Exposure system consisting of the Exposure 2010S CD player and integrated amp ($1250 each) connected to diminutive NEAT Acoustics Motive 2 loudspeakers ($1995/pair) by entry-level Kubala-Sosna speaker cables. 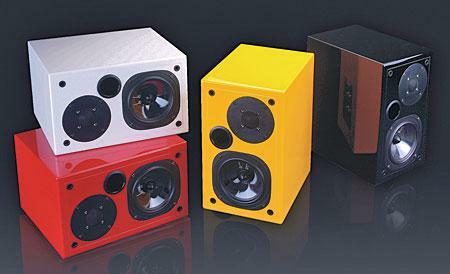 Rein and CA dealer Michael Silver of Audio High then proceeded to blow my mind with budget magic. As was the case with the new, even lower-priced Denon system I described yesterday, the system's evenly balanced, full-range sound blew me away. Now I understand why Stereophile has heaped praise on Exposure Electronics. I'd love to hear this stuff powered by after-market power cables and a power conditioner of some sort. Stuff that sounds this good can only sound better when given the opportunity to demonstrate its full potential.